A Science fair was held at New Barrackpore ( North 24 Parganas, West Bengal, India) from 20th to 26th December 2008. 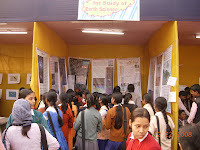 Jadavpur Centre for Study of Earth Science organised one stall at the exhibition. 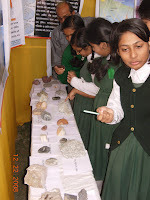 The main exhibits of the stall were rocks, fossils, minerals and a set of posters on Earth Science. About 10,000 Students teachers and common people visited the stall with great enthuciasm. I have visited the stall. It was very educative. All schools must have such resources.